Admittedly not as good as Grandma's Christmas cookies, but aside from that, these cookies rival anything else you'll find in stores. 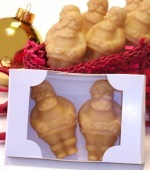 Delicious maple cream sandwiched between two soft cookie waffers, shaped like a maple leaf. 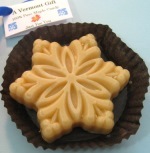 These cookies are sold throughout Vermont in virtually every gift shop and supermarket. Why? Not because they're mass-produced, but because they're a customer favorite. If you don't agree that these cookies are well worth the price, just let us know and we'll promptly refund your money. To date, we have never had to refund a single customer! 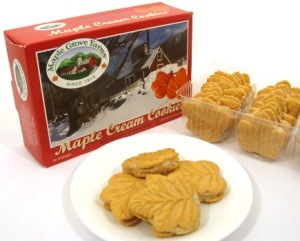 And if you're looking for a great, yet simple and affordable Christmas gift, you can't go wrong with a box of maple cream cookies. Ingredients - Enriched Wheat Flour (containing Niacin. Iron Thiamine, Mononitrate, Riboflavin, Folic Acid), Sugar, Partially Hydrogenated Vegetable Shortening (may contain Canola and/or Soybean and/or Cottonseed Oil), High Fluctose Corn Syrup, Pure Maple Syrup, Salt, Sodium Bicarbonate, Artificial Flavors, Ammonium Bicarbonate, Artificial Color (FD&C Yellow #5, Red #40, Yellow #6, Blue #1). Allergy Information - Contains Guten, Soy, Wheat and manufactured in a facility that processes egg products, dairy products, peanuts, soy, tree nuts, wheat, sulfites.